The CorePAD® is a serious exercise tool for the exercise professional that understands the value of MicroProgression®. It allows one to progress into starting positions of extension for crunches before introducing other complicating challenges such as unstable support like a ball. It can be used for a variety of other exercises as well. A Note of Truth: This device is not magic. 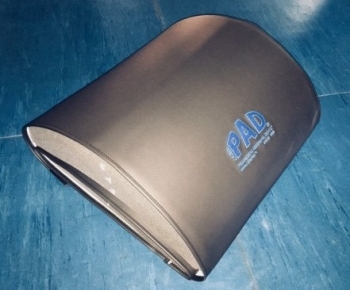 Just like any other exercise device, the CorePAD® will not spot-reduce fat from one's midsection. This device is designed for use only by a qualified Exercise Professional who has demonstrated competency in Exercise Mechanics, structural evaluation, the neuromuscular influences upon structure, spinal mechanics and pathology, and the thought process associated with the implementation of the RTS® principles of MicroProgression®, Strategic Variation® within the Functional Continuum® as determined by an individual's Skeletal-NeuroMuscular Opportunity. The CorePAD® is never the place to initiate crunches with an individual. As the "P" in P.A.D. indicates, it is for the Progression of crunches... once tolerance and competency are established. It is numbered for progression of the starting position of crunches (spinal flexion) only and therefore for this exercise should always introduced at the lowest pad level/height. Other motions of the spine may best be introduced at specific higher levels. CorePAD® use for rehab should only occur after the patient demonstrates competency with both basic segmental stabilization training and elementary motion exercises. 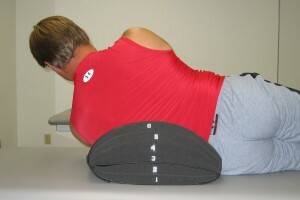 Even level 1 may be extremely advanced for specific spinal rehab patients. The individual must demonstrate complete competency on a flat surface such as the floor prior to introduction of any degree of "starting extension". DO NOT start above level 2 for pain free individuals and level 1 for those in spinal rehab. DO NOT progress more than one P.A.D. level at a time and only when complete competency has been demonstrated via precise control over the path of motion, range of motion, and inertia. 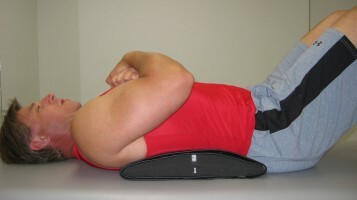 The introduction of the CorePAD®/extension position into crunches that involve spinal rotation (with the pelvis/legs rotated to the left or right) should only be offered by Exercise Professionals with an understanding of Type III coupled movement mechanics wherein the introduction of extension limits facet movement into rotation and vice versa. Begin with enough P.A.D. levels to bring the spine of the sidelying individual to frontal plane neutral or even further by starting in lateral flexion toward the table (apex up). Begin with a comfortable amount of spinal flexion (or reduced extension) prone over the pad. The size of one’s midsection will play as great a role in your choice of starting level as his/her available spinal range. Most individuals will be able to start comfortably on level 6. In fact starting flat or at the lowest levels may be uncomfortable due to prone creating an extreme of extension. It's not a rep/set unless it's precise and controlled. The first rep should look exactly like the last rep.
Stop the set when the static joints move, when the moving joints no longer move with precision. You should be able to stop immediately at any point in the range.